January 6, 2012, Royal Opera House (Covent Garden), London,. Neither fire nor iron; neither the law, nor the punishment; pain, madness, or fate or death… “Brave tout, je le feu, le fer et le même ciel!”. There is no horror that shudder Carmen leather. Neither the failure who accompanied Bizet until his death could prevent that his last opera has become one of the lyrical titles most frequently represented, to the extent that anyone who listens the name of the Gypsy still evokes necessarily to the operatic genre as a whole. Therefore, it is not easy to represent this “opera comique” accurately. 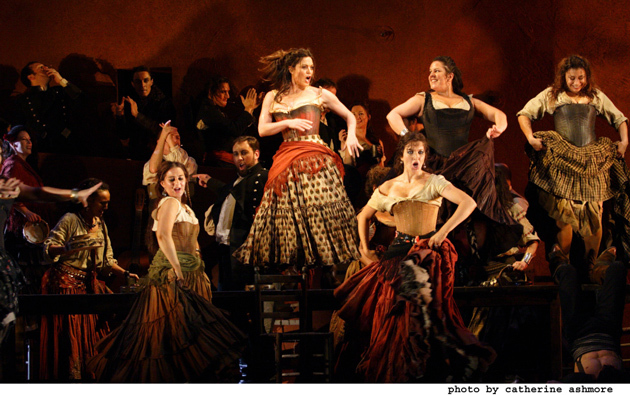 While it is true that are almost always too many fortunate coincidences which each function should be combined to leave the opera theatre satisfied, with ‘Carmen’ difficulties are increased, as it was seen the night of January 6th. at the Royal Opera in London. And who writes does not refer to phlegm that crossed to Roberto Alagna at the end of the brutal Duet that concludes the work: this type of accidents sometimes not preventable and does not seem fair to judge a tenor who until then, and even in the midst of trance, knew how to play with something more than just good tables. I’m afraid that faded tone function is due to other causes that I will try to unravel. It is not the first time that this production by Francesca Zambello climbs to the London stage. Its premiere took place in 2006, being the result of an agreement of co-production between Norway National Opera and Opera Australia. The show offered therein is guilty of notable imbalances. On the one hand, the proposal of Zambello seeks some vagueness: the space is composed of terracotta-colored mobile modules, trying to represent in a stylized manner all the stages of the work (streets, the tavern and the mountains that overlook the bandits hideout), but without in any way representing Seville; in fact, these streets could belong better to Timbuktu to any Andalusian city. Costumes mixes styles and epochs: pairs of extras with civil suits of the era of Isabel II, dragoons of Alcala converted to guard of 1930, most conventional suits of lights, or designs for a Gypsy – including the protagonist – which seem to be inspired by the imagery of ‘Carmen, from Ronda”. These latest models lead the index of elements which contrast with the supposedly neutral environment of the scenery: from tambourines, with flags with the colors of the Andalusian badge of 1918, facas, carabiners (the final scene of the third Act contains a choreography in which blades take enough role) to a throne of Holy week with a Virgin of solitude (with its “palio”, candles and carnations, but without bearers) which is showed only for the blessing of Escamillo and his gang before entering the bull ring. As much as this accumulation of topics could Squeak us Spanish viewers, which at the minimum we renounce unfortunately our quirky idiosyncrasy, we must not forget that Bizet opera recreates with the free adaptation of melodies, rhythms and other musical resources typically Hispanic (pasodobles and Spanish boleros, Cuban habanera, string sections that mimic both strumming and plucking of a guitar, etc) a picturesque and exotic Spain romantic artists of all disciplines had been created and that it only existed in the imagination of the French culture of the s. XIX, since the Seville tenor Manuel García triumphed with his polo “The smuggler” in Paris. Therefore, we could not accuse as “mock Spanish” the work of Zambello without blame it also on the composer, by more than the result of both achieved very distant quality grades. Another story are the choreographies, following the classic formula of the American musical but without the precision or cleaning of movements that characterizes them. On the other hand, not lack of authenticity – I insist on that an approach like this is the least importance- but even variety or illustrative or environmental significance. Glaring example is the second act in the tavern, where falls in the vacuous triviality and the unnecessary repetition both in the number “Les tringles des sistres tintaient” as in the aria of Escamillo. However, the fights were well choreographed and executed by the soloists. 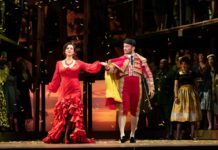 So far we’ve talked about what could perhaps overrun this Carmen, but don’t think that all that was there was overruned, there was, no doubt, quite scenic and musical effort back, even though the outcome was doubtful. With her performance, Anna Caterina Antonacci got to shake from her at times that typical “correct incorrection” in the representation of the role, with physical work that deserves to be designated. Admittedly, is only half seen the pristine ringer and, at the same time, voluptuous that often accompany the singer, however even with its somewhat depleted vocal means, Antonacci usually always give us some phrases to taste. We did not have such luck this time. The line of singing was usually monotonous to what we are accustomed: flat canto spianato with short declamatory sense (how different would have been the cards aria! ), appreciating difficulties in the execution of embellishments (turns and appoggiaturas or mordents) as well as in the modulators game. Although yes, generous in her high always, even in singing the passages of the canto di sbalzo, and in general correct even without being in fullness of faculties. 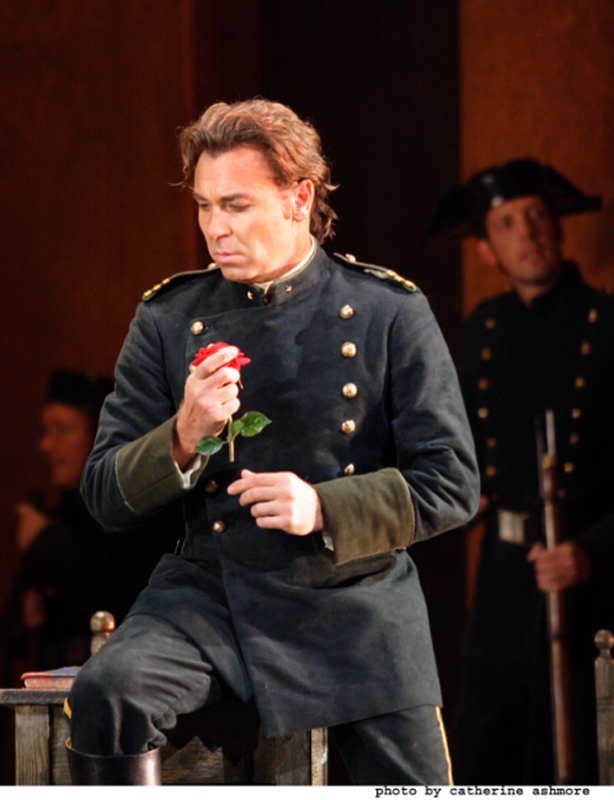 Roberto Alagna, beyond the aforementioned phlegm and some problem in the change to the full voice to the falsettone in pianissimo at the end of his duet with Micaela in the first Act, offered several sparkling acutes and a brave singing in many passages (particularly in the third Act), although vigorous in excess and almost always thick stroke. Perhaps such limitations are due to the tenor insisting on addressing excessively dramatic roles for an instrument like his, predominantly lyrical: Unfortunately, this ends up taking a toll, and perhaps this is also the reason for his increasingly frequent vocal accidents. 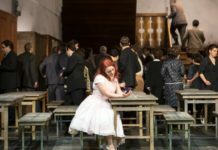 Soprano Verónica Cangemi to so much joy has given us for years facing the Italian Settecento roles, overcame with mere correction the demands of the Duet from the first act. At aria in the third Act, “Je dis to rien ne m’ épouvante”, failed to create the lyric atmosphere that requires the aria, plus suffering certain troubles, both in B flat on the verse “ont fini par faire an infamous”, and to a lesser extent in the B natural that culminates the phrase “parlerai haut devant elle Je… ah!”. Notable was the performance of Vito Priante as Escamillo, a still young singer that still have years to win body in his voice. He especially shone in the third act duo with Alagna: both offered the best of themselves. Although he can overcome with solvency roles like this, Priante is even more convincing in Mozart and Rossinian roles. It is worth mentioning to Nicolas Courjal as Zuniga (truth , whole and well projected voice), Adrian Clarke and Stuart Patterson in the Munchner and Remendado, especially in the second act Quintet, as well as Simona Mihai and, especially the mezzo-soprano Nadezhda Karyazina (as Mercedes). The same thing can be sayed form Ashley Riches in the role of Morales. These three last mentioned singers belong to the program for young artists Jette Parker. Very estimable interventions of the choir (especially the scene of the cigars makers in the first Act) and outstanding children’s Choir: with donaire in their movements, and perfectly tuned, especially those who “fall wounded in the battle”. All buts cited above called even more attention in the case of a production whose musical direction is headed by a director who, when he proposes, extracts gold from Orchestra and singers. So far, who writes always has enjoyed much functions conducted by Maestro Oren. Since the Overture he made it clear that his reading would be energy, light, sparkling, spirited with accelerated tempos, perhaps too accelerated in the arias of greater lyricism (as the of Don José and Micaela and carts aria), but very successful for almost the rest of the work. This is a luxury that the director can afford to have an orchestra as the one of the Royal Opera House, extraordinary accuracy, articulation and tuning. However, is missed more worked phrasing, greater ductility and rubato, something that both this Orchestra and this director are accomplished in other occasions. 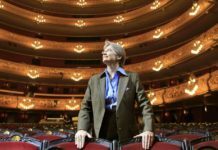 Main pages, both the duo of Don Jose and Escamillo and the final Duet in the fourth Act, can be considered the best offered by Oren and the soloists, beyond the previously targeted drawbacks. Libreto of Henri Meilhac and Ludovic Halévy, based on the novel by Prosper Mérimée Edición: posted by Alkor-Verlag Kassel, edited by Fritz Oese.